Treasure Hunter* is a light fantasy themed card drafting card game from Richard Garfield, the man behind the Magic (and Android: Netrunner, RoboRally, King of Tokyo etc). The game is listed for ages 8+ and should keep two (I’d say three) to six players entertained for about an hour. I can’t see a UK price listing yet, but it should retail at about £30 when it hits game stores soon. Treasure Hunter sees you draft a hand of nine cards then play them out over a simple three-step round (a bit of bidding, some winner-takes-all and then basic accumulation). This is done five times, with the person gathering the most goodies (ie, victory points) being crowned the winner. In the rather oversized box (I can only presume many expansions are planned…) you’ll find the game board, 75 cards, about 100 cardboard tiles and a bunch of cardboard coins. The components are of a pretty high standard and the artwork from Markus Erdt is great – as long as you like your fantasy art with a very cartoony style (think World of Warcraft – in fact he did the ‘Soul of the Forest’ card in HearthStone). The one downside is the lack of a linen finish on the cards. This is a card drafting, which means you’ll be shuffling five times per game and handing round/using the cards almost constantly. Not going the extra mile to make the cards super sturdy is a big shame. Treasure Hunter may not be as simple a drafting game as Sushi Go, but its also a long way from the complexity of 7 Wonders. A game sees players essentially doing the same thing five times over five rounds and the rounds are pretty quick. This means its easy to do a dummy round if you have competitive players who really want to win, even on their first play through of a game. The small game board isn’t necessary, but does add a little theme while nicely showing how the game turn plays out: after drafting you’ll be sending adventurers into three different (colour coded) adventure areas, then dealing (or not) with the local goblin horde – before counting any spare change you may find in your backpack. These adventures, as you may have guessed, are played out with your nine cards. One of Treasure Hunter’s real strengths is that while there isn’t a huge variety in the cards there feels like the exact amount there needs to be to make it work: no surprise really, knowing Richard Garfield’s pedigree with card games. In short, cards are either adventurers, equipment, hounds or money. Adventurer cards must be played when their colour adventure comes up; equipment can be laid optionally to help your adventurers; dogs fight off goblins and money is just simple points. Set-up shows what spoils will be on offer that round, so is the perfect time to explain the tiles on offer. This saves a lengthy pre-game description session that you know half the players will forget anyway. You only need to explain one thing at first: some tiles have an automatic score, others need you to turn them in on a round to score – meaning they get riskier the longer the game goes on (you may score points for each money card you had in a round, for example – so the more chances you have to nail that condition the better off you should be – in theory at least). Drafting couldn’t be simpler – deal nine cards to each player, then each player keeps one (placing it in front of them) and passes the rest on. Rinse and repeat until you all have nine cards, then begin the round. No discards, no funny business. Next you play out the three adventure areas. Lay all your adventure cards (numbered 1 to 12) of the current colour and see who has most: this player leads the ‘bidding’, where players can add equipment cards to help them win tiles. You’ll notice each area will reward both the high and low score in a round, keeping all the cards important – especially as some of these ‘rewards’ are actually cursed – meaning negative points. Then comes your hounds versus the goblins: a simple case of first seeing players pay out on any goblin they couldn’t defeat – then the player who had the most hounds taking any spoils left my their fellow players (plus the goblins themselves for a small extra reward). Coins just give bonus points at the end of rounds – boring, but they add up and its nice to have a card you know is safe bet. After five rounds, the player with the most points wins. The writer: Its no surprise that Garfield got it right – the bigger question should be, how has it taken so long for a great drafting game of this weight to arrive? Treasure Hunter isn’t big or clever and there is nothing even vaguely new here. The theme is a paste-on, it has little to no ‘narrative arc’ and could even be accused of being repetitive. So why do people keep asking for repeat plays? Because it’s FUN, of course. You draft a hand and use it and if it all goes wrong, who cares? You start again the next round. The tiles you need to use to score add a nice ‘push-your-luck’ element to scoring, while the ‘cursed’ negative tiles mix things up nicely too. The thinker: I was a little sceptical about playing a ‘light’ drafting game, even after the rules explanation backed the game’s light credentials to the hilt. But despite my reservations I found a game packed with enough decisions, and fun, to easily hold my attention for the hour-ish we played for. Especially in a three player game you have the delicious prospect each round of knowing a third of the cards in play – and that you’ll keep three of that starting hand. A few seconds later you get the next third – but what did they keep? And then you see the last nine – and realise how things may pan out. Make no mistake – this is a very good, if light, drafting game. The trasher: I haven’t been a fan of drafting games before, but Treasure Hunter won me over almost immediately. Because there isn’t a lot of different cards, and each round plays them all out, even the most innocuous card can be be significant in a round. Tactical players will be especially engaged, as you have to change your plans on the fly as you see more of what’s in the round. Choosing your battles (of the three colours) becomes more important with higher player counts as less players are rewarded, and despite its simplicity every hand plays out differently. The dabbler: I enjoyed this one too – a rare clean sweep of praise! But that being said, I can’t work out if its greatest strength is just that – the fact everyone is happy to play it. There are games that are more, well, everything really. As mentioned it doesn’t bring anything new to the table, it has a a hackneyed (if popular) generic fantasy theme and little depth. It has already been backed with an expansion, and it’s easy to see how it can be changed-up in almost every area for those who want to do so. But will it live long in the memory? To be honest I don’t care – it’s just nice to have a game everyone is happy to play! My only issue with Treasure Hunter is listing it as a two-player game. I know this means a big jump in sales, but drafting and bidding really are three-plus player mechanics and I’d have no desire to try this with two. It does add ‘special’ rules for two players, but this is only in how you draft. You still have a ‘min’ and a ‘max’ tile, so essentially you’ll both be winning something every round – unless a duff card deal means one player gets both tiles. This, frankly, sounds awful. Its not for two. Some say the game plays a little long but I would suggest that would be down to the players, not the game. Sometimes its hard to pick a card but this isn’t the game’s fault. And as the game plays in five rounds, there’s no harm in house-ruling down to four or even less if you want a faster experience. Others say the only choices you get are in the card selection (drafting) part of the game. If this is a problem for you, I guess you already ran a mile at the ‘light card drafting’ in the first line of the review. If not, go now. That is the game, and its why it works. A lack of innovation is a sound criticism, but I think I forgive it because there simply isn’t a stand-out game in the category. It’s not like Dominion, which arrived fully formed – then every Joe Shmo with a box of half-cocked fantasy art made a worse version of it the following year. Drafting has been under-represented and this is a very good addition. Comparisons to ‘7 Wonders’ are lazy – this is a very different animal. Comparisons to Donald X Vaccarino’s ‘Greed’ I unfortunately can’t comment on, but having enjoyed this (as well as some of Donald X’s other games) I really want to play it. Any comments on this comparison would be welcomed, while I’ll update here once I’ve gotten to try it myself. Treasure Hunter has flown surprisingly below the radar in terms of English speaking media so far, which strikes me as very odd. 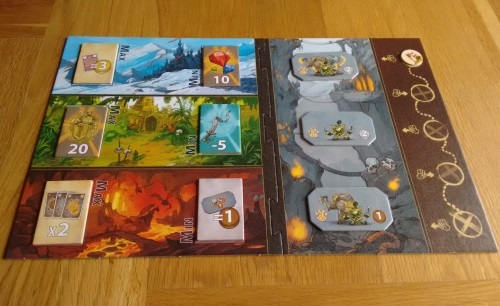 There are few safer pairs of hands in the industry than Richard Garfield, while Queen Games is one of Germany’s biggest publishers and no stranger to massive hits (if also a little controversy). It doesn’t help that it hasn’t hit the retail shelves in the UK yet, of course. I can only think its just a matter of time as there were plenty of copies available at Essen for its launch. Hopefully it will be easily available before Christmas. I guess you’ve guessed by now but, for me, this is one of the games of the year. It won’t win any award for innovation, or super high Board Game Geek ratings, but it gets a massive thumbs-up for doing what no other game has done until now for me: get the formula for a light drafting game absolutely right. * I would like to thank Queen Games for providing me with a copy of the game to review.